On April 24, 2015 the dutiful street sweepers of Bonifacio Global City, specifically in the corner of 9th Avenue and 34th Street, will be temporarily replaced by guitar-donning, drum-beating ambassadors for Mother Earth. 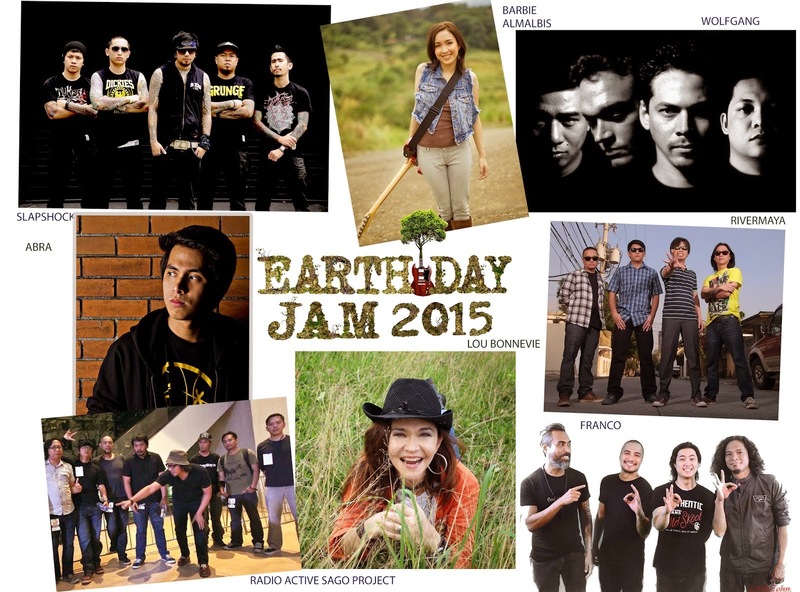 It’s Earth Day Jam 2015. This musical marathon for the celebration of the worldwide Earth Day movement is on its fifteenth year and with no signs of slowing down. 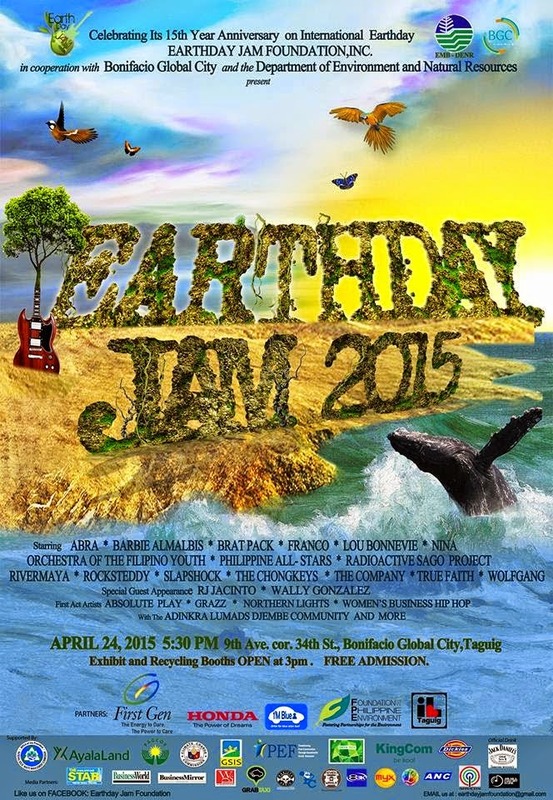 Describing Earth Day Jam 2015 as the biggest street party to hit Metro Manila would be an understatement. The stage is set for a blend of pop-rock genres and an eclectic mix of Reggae and World Music. Over 20 artists are slated to perform. Some of the hottest acts and bands that will be performing that night include Abra, Barbie Amalbis, Bratpack, Franco, Lou Bonnevie, Nina, Orchestra for the Filipino Youth, Philippine All-Stars, RadioActive Sago Project, RiverMaya, Rocksteddy, Slapshock The Chongkeys, The Company ,True Faith and Wolfgang with the Adingkra Djembe Lumads Community with the special participation of Pinoy rock legends RJ Jacinto, Wally Gonzalez . Fronting artists include rising indie bands Absolute Play and Northern Light with the voice finalist Grazz, and Women’s Business Hip Hop. Overall Direction is by music guru Toto Gentica. Spearheaded by none other than Philippine rock icon Lou Bonnevie and the Earth Day Jam Foundation, this event has slowly grown to become the highly anticipated musical phenomenon it is today, raising comparisons to other “Unity through Music” type concerts such as Woodstock and Live Aid. Whatever the case, this talent-packed, one-night marathon of music and advocacy is sure to continue making waves in both the environmental and musical scenes. Need we say more? Hit the corner of 9th Avenue and 34th Street in Bonifacio Global City on April 24, 2015 starting at 3 p.m. for the Recyclables Fair and Exhibit. And at 5 p.m., rock out to the cleanest street party Metro Manila has ever seen for the cause of Mother Earth. Earthday Jam is a special project of Earth Day Jam Foundation, Inc. in cooperation with Bonifacio Global City and EMB-DENR .Its partners include First Gen Corporation, Honda Philippines, The Foundation for the Philippine Environment, the National Solid Waste Management Bureau and Ayala Land. It is supported by PAGCOR, GSIS, Peace and Equity Foundation, Green Technology Vehicles & Equipment and KingCom. Official drink is Jack Daniels. Official Shirt by Dickies. Media Partners include ABS CBN, Myx Music Channel, Philippine Star, Business World, Business Mirror, WDS, 83 Design Studio, Grab Taxi and WhenInManila.com. Various NGOs, representatives from the world of politics, showbiz, civic society and theatre, literally all facets of society, not just the music scene, will “jam” together on that one night for Mother Earth. The activity will start with a Recycling Fair and simultaneous exhibits from DENR, Young Visual Artists, Firefly Brigade and other green organizations starting 3pm. The concert commences at 6pm up to a music marathon of close to 10 hours of festivities. For more info, please call 8976991, email earthdayjamfoundation@gmail.com or log on to www.earthdayjam foundation.com .You can also like Earth Day Jam Foundation on Facebook.